This fresh and easy salad is a great accompaniment to many dishes. It is flavorful, but does not compete. I like to make this salad with sweet, low-acid Cara Cara oranges. Use walnut oil for an aromatic and flavorful dressing. See my posts on how to make a great vinaigrette, walnut oil and Jerez Spanish sherry vinegar. This fresh and easy salad is a great accompaniment to many dishes. It is flavorful, but does not compete. I like to make it with Cara Cara oranges when I can find them. Prepare oranges by slicing off the ends, and then slicing the peel off, strip by strip. Once all the peel and white pith have been removed, segment the orange by sliding your knife on either side each segment's membrane. The result is you have slices with no membrane. Combine the shallots and vinegar in a small bowl. Slowly whisk in the walnut oil to make an emulsion. Add salt and pepper to taste. 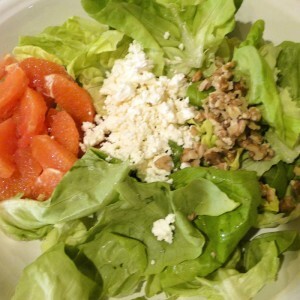 Put the butter lettuce, feta and walnuts in a bowl. Toss with dressing.